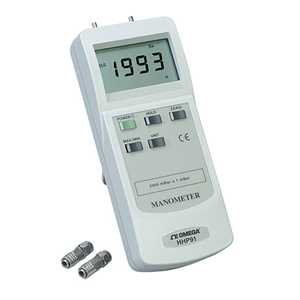 Model HHP91 is a precision manometer for automotive, HVAC, laboratories, and general industrial applications. The unit comes complete with a built-in sensor with dual inputs for gage or differential measurements. It is compatible with air or non-corrosive and non-ionized gases and liquids. Either port measures the full range. P1 is positive with increasing pressure, P2 is negative with increasing pressure. Eight selectable pressure ranges make this instrument compatible with all measuring systems. The readings are easy to read, displayed in large 15 mm (0.6") high digits. 注: Comes complete with two quick-connect tube fittings, 9V battery, meter, hard carrying case and operator’s manual.